If you’ve been to the Maldives, or read about its many resorts, turquoise is a colour you’ll be familiar with. It’s a word you’ll have heard more than once. It is this blend of blues that strike you as soon as you touch down in the island archipelago, if not before (did you have a window-seat on the flight?). But a short speedboat ride away from Male’ International Airport lies Taj Exotica resort, where turquoise has become a way of life. Located on the thin island of Emboodhoo Finolhu – 55m at its widest point – the resort’s perch, on 200 acres of peacock blue shallows on the north-eastern tip of North Male’ atoll, means you will eat, sleep, and breath this uniquely Maldivian hue. Turquoise time begins upon arrival, with shell necklaces, rose petals and bodu beru drum beats washing over you at the jetty as the cyan seas wash beneath. From here, buggies run the length of the 550 metre island, transporting guests to villas and suites arranged either side of the tree-lined thoroughfare. 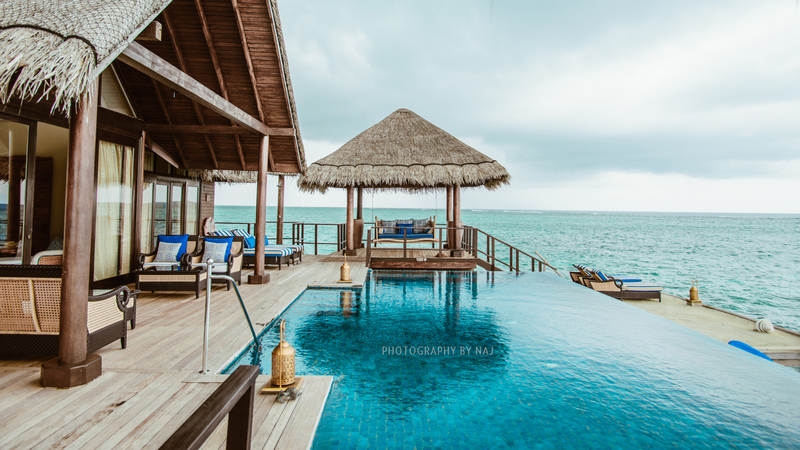 After tempting you in with aquamarine excerpts through the foliage, the resort leaps out onto the reef with an almond shaped outcrop of overwater villas, culminating in the spectacular Rehendi Suite. 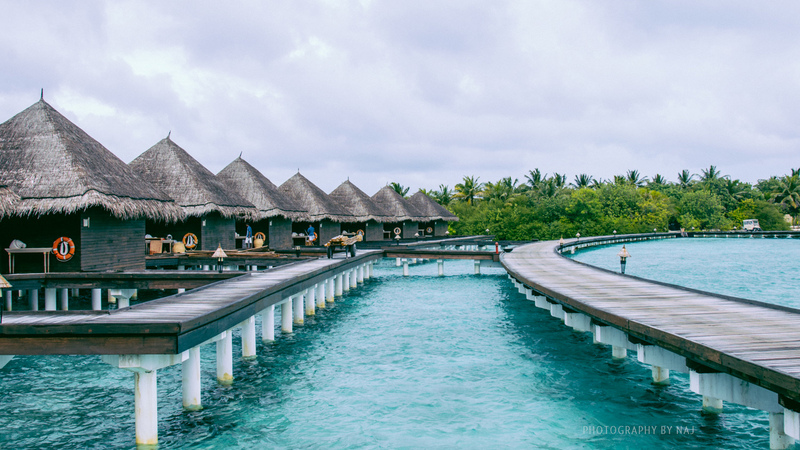 The plentiful supply of water villas offer seclusion and privacy – each with its own pool – and a view from every room of that persistent pigment, which is already beginning to take on hidden meaning. Ocean and beach suites offer more space and even their own private overwater beach terraces . All rooms have 24 hour dining and butler services. As part of the the Taj Hotels group, Exotica excels in its quality of cuisine, offering a staggering array of fine dining, and speedy service, in the resort’s two main restaurants. Indeed, some guests claim to have visited the resort for ten years without trying the same dish twice. For the man who has tried everything, however, there’s always ‘The 200 Dollar Pizza’ featuring foie gras, black truffles, lobster, caviar and edible gold leaf. (Imagine the $300 pizza!!). The main restaurant, ‘24 Degrees’, offers all-day dining from around the world, while ‘Deep End’ brings guests award-winning wines and specialty grill and seafood dishes, served above that now-familiar shade of blue. For those seeking something a little more special, they can surround themselves with romance – and more turquoise – on the ‘Wedding Pavillion’. If this still isn’t enough, a quick boat trip to the ‘Ocean Pavillion’ – regarded as one of the most unusual dining spots in the Maldives – allows couples to immerse themselves completely in the amorous azure. As well as the option to feed the local fish and rays every evening, guests can feed each other, with chefs happy to grant you a ‘license to grill’ at the outdoor cooking stations. (Classes are available every Friday for those hoping to make a good impression on their significant other). 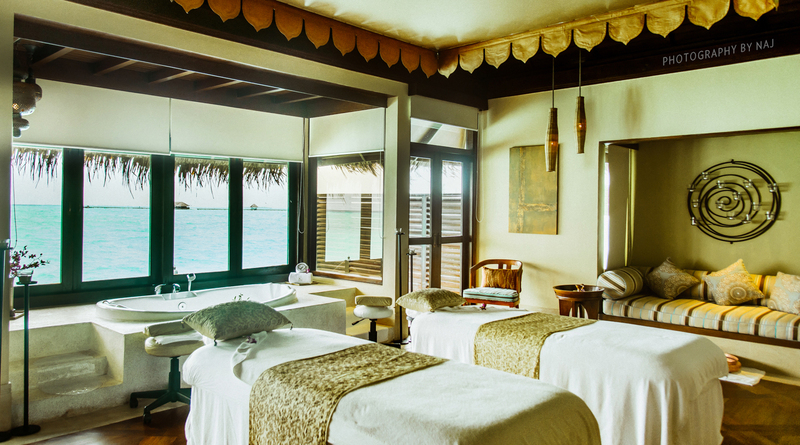 With the taste of turquoise taken care of, Taj Exotica is also notable for its excellent spa facilities, with the services of the Jiva-Grande spa dominating southern end of the island. Drawing from the company’s home, the spa offers a wide range of Indian treatments with Ayurvedic philosophy, from complementary yoga each day to the spa’s signature Alepa mud treatments. All materials used in the spa are organic – from the linen to the oils – and all treatments are performed in full view of that tranquil tint. The large shallows in which the resort resides is perfect for water sports, snorkeling, or just being – with hammocks waiting just a short wade away from the beach. For those anxious to explore the bigger blues beyond, fishing trips, sunset cruises and visits to nearby island communities are all on the menu. 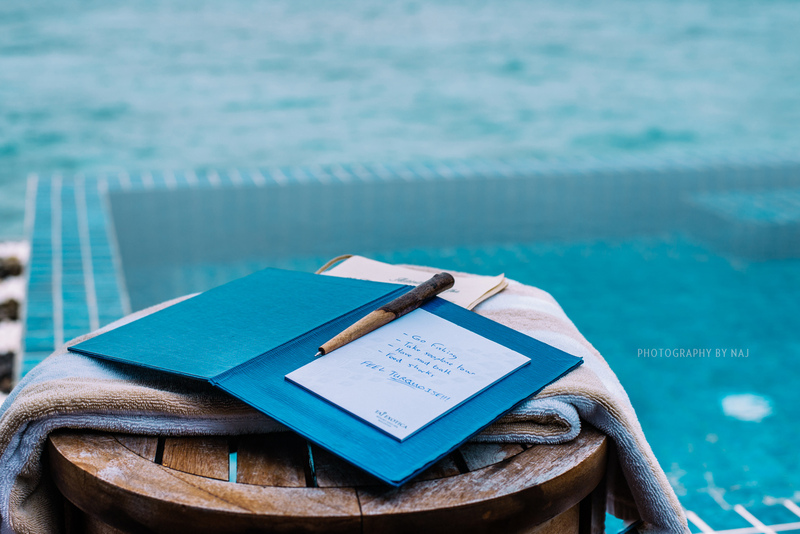 It is with good reason that Taj Exotica continues to win multiple awards each year for its romantic atmosphere and excellent service. 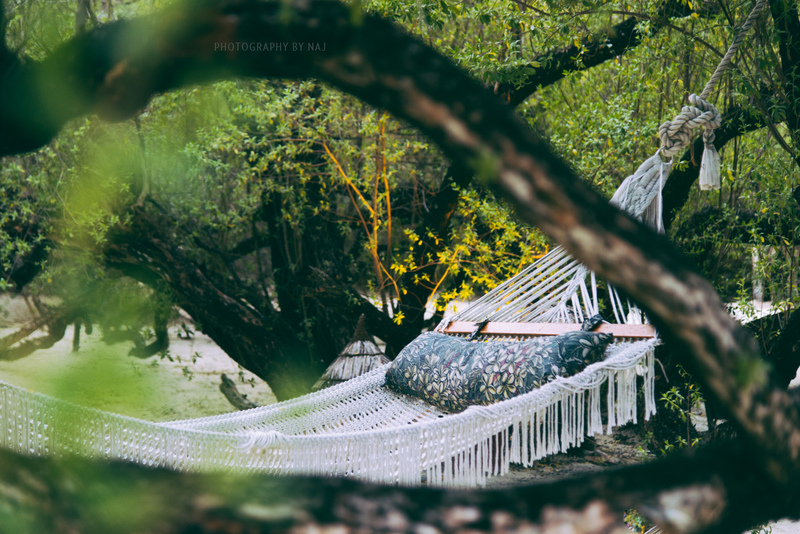 By the time you’ve finished your stay, you’ll begin to know how turquoise truly feels! !